In 2013 a participatory research project explored food security in Pictou Landing First Nation, a Mi’kmaq community geographically located in Canadian province of Nova Scotia. The project used photovoice—a qualitative research method that collects photographic data along with oral information from project participants. The findings revealed that pollution and ecological changes around Pictou Landing First Nation were the most significant community challenge to eating well. Community members shared photographs and stories to describe their experiences with food and point to their key concerns, which also included physical and economic access to healthy food. Participants also commented on a number of great assets in the community, such as the recent development of community gardens and the knowledge of traditional foods that still exists in the community. 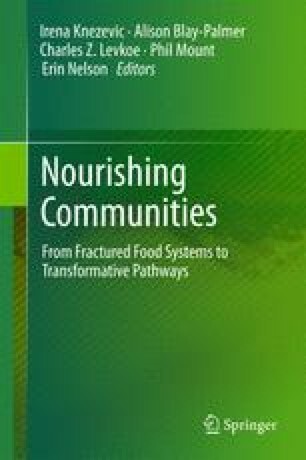 This chapter offers reflections on the project’s findings and on the use of photovoice to examine social dimensions of food systems . The chapter also considers the larger implications of these findings to the issues of Indigenous community food security, cultural safety, and ecological consequences of industrialization. This project was funded by the Atlantic Aboriginal Health Research Program with additional support from the Confederacy of Mainland Mi’kmaq and Activating Change Together for Community Food Security (funded by the Social Sciences and Humanities Research Council, and led by FoodARC, Mount Saint Vincent University and the Nova Scotia Food Security Network). Time, energy and space were also generously donated by the community of Pictou Landing, Pictou County Health Authority, Pictou County Food Security Coalition, FoodARC and the Nova Scotia Participatory Food Costing and Activating Change Together for Community Food Security projects. Canadian Community Health Survey. 2008. Household Food Insecurity In Canada in 2007–2008: Key Statistics and Graphics. http://www.hc-sc.gc.ca/fn-an/surveill/nutrition/commun/insecurit/key-stats-cles-2007-2008-eng.php. Accessed 22 Sep 2013. Canadian Community Health Survey. 2010. Household Food Insecurity In Select Provinces and the Territories in 2009–2010. http://www.hc-sc.gc.ca/fn-an/surveill/nutrition/commun/insecurit/prov_ter-eng.php. Accessed 22 Sep 2013. Green-LaPierre, R.J., P.L. Willliams, T. Glanville, D. Norris, H.C. Hunter, and C. Watt. 2012. Learning from “knocks in life”: Food insecurity among low-income lone senior women. Journal of Aging Research, 2012: 11, Article ID 450630. http://www.hindawi.com/journals/jar/2012/450630/. Accessed 1 Oct 2013. PhotoVoice. 2012. About PhotoVoice. http://www.photovoice.org/about/. Accessed 3 Oct 2013. The Nova Scotia Participatory Food Costing Project. 2011, 2009, 2006, and 2002. Food costing Report. http://foodarc.ca/food-costing/resources-publications/. Accessed 1 Oct 2013.